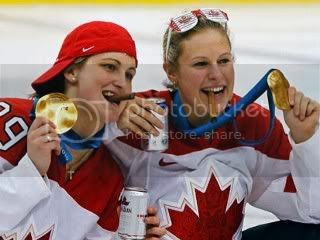 Anyone see all the Gold Medal girls smoking cigars and drinking beers to celebrate their victory over the USA? My kinda chicks!!! Hockey (good Hockey), Beer and Cigars. i was gonna post this if it wasnt already up when i came into work this AM. Pics were cute. Maybe a bad idea for the 18 year old to drink in front of the news crews... but still. I dont see the fuss. Smoking isnt any worse than the official sponsor of them, McD's. Smoking isn't any worse than the official sponsor of them, McD's. Good point. I love how people get all high and mighty about something like cigar smoking or beer drinking, yet they'll shove a Big Mac down their throats. Trust me, I like a Big Mac as much as the next guy, but I could never have one with as much frequency as I would a cigar or a beer. I'd be wearin' Jerrod's old pants!!! LOL! Here ya go ! They are My New Heros! I heard about this too. Sounds like a great way to celebrate an Olympic medal to me. I've used this argument with people who get on me about smoking. It's amusing to watch them stumble over their words trying come back with something. On topic, how many times have we seen a sports team win a championship spraying champagne and beer all over each other while smoking cigars? It's the same thing. I wonder if this was the men's team if it would be a different story? I don't find anything wrong with it, but I can see the other side. Olympics are poised as a "safe" thing for children and family's. Also a lot of kids look up to these performers and teams so having them drink and smoke while on the ice, wearing the gold and on camera is a bit much. But with the way things are these days, I think much worse have happened in sports and entertainment. +1 I see both sides as well, but no problems with what they did here. They are HOT!!! They won the GOLD MEDAL !!!! When the "MEDIA" does something of note one day (anyday actually) then I will read and give some consideration to what they write. When you have no real news to write about, you start looking for something, anything to fill your alotted pages, or minutes on air. I laugh at the way the media today forgets they are there to inform us, not to try to make the news. "Just the facts mam". that's all I want from my news. I am intelligent enough to make up my own mind thanks. I guess maybe it was easier to write about that, then to lament the loss? It was a good game between two very close teams, 'nuff said. IMO.